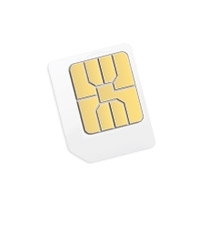 Technical Description: 3G Three MICRO USIM ROLLING MONTHLY 1GB SIM PACK Call to Connect - 35080 (Phones Phone Accessories) Pay As You Go + 1. 1GB - £10.49/30 days Details of your Pay As You Go deal 3 Months Free Spotify Premium on Mobile Broadband.Offer available to customers registering and connecting a new mobile broadband connection (Pay As You Go or Pay Monthly) from Three in September and October 2010. No additional data allowance included in offer, music streaming will use your normal allowance. 1GB of data will give approximately 14 hours of listening at the default settings of the Spotify Application. At the end of the free period customers can opt in to continue paying for Spotify Premium at £9.99 per month. To redeem go to www.three.co.uk/freespotify when connected over mobile broadband and enter the phone number associated with your mobile broadband sim card. An existing Spotify Premium account cannot be converted to free for the period of the promotion. Customers can either upgrade an existing Spotify Open subscription to premium or create a new account. Offer closes 30/11/2010. Details of your deal iPad Micro-SIM Pay As You Go + 1 What's in the box •Your 3G Micro-SIM Your iPad Micro-SIM is already loaded with the data allowance you have chosen. Pay As You Go •Your iPad Micro-SIM is already loaded with the data allowance you've chosen •1GB data allowance •Valid for 30 days •Top-ups available: 1GB £10 3GB £15 7GB £25 When you run out of data you can buy a top-up plus an Add-on, if required. All products are delivered free of charge. If you order one of the products listed below before noon on Monday to Friday, it will arrive the next day: Contract phoneTabletPAYG phoneMiFi wireless dongleOrders placed after 12 on a Friday or on a weekend will be delivered on Tuesday. Mobile Broadband dongles and SIM Only products will be delivered up to 5 days after your chosen delivery date. Laptops will arrive between 3 to 5 days after the your Broadband dongle has been activated. All deliveries are subject to availability. As you're buying Mobile Broadband from 3Store online, should you change your mind you can return it, so long as you return it within 14 days from the date of delivery. You'll need to call first to get a returns authorisation number.You can use USB Modem (and laptop if that was part of the offer) but we ask that you send everything back (including the modem, SIM, cables, any documents, packaging, laptop and free gifts if they were part of the offer). Everything needs to be returned in 'as new' or 'as sold' condition. Otherwise, we may not allow you to return the items and cancel your agreement with us, or we may charge you for any items or components that are missing or damaged.If you bought a PAYG or Starter Pack and use it, please make sure that you do not use it for more than three days. We are unable to offer a refund on any additional Top-up vouchers as part of this returns policy.